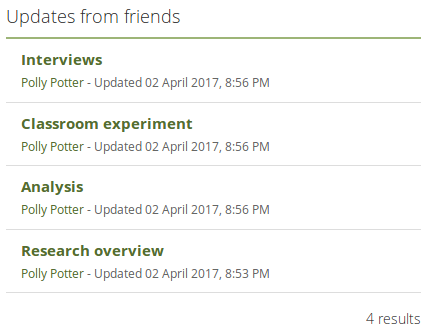 You can see a list of all new features on Launchpad or check out the user-focused features via the „New in Mahara 17.04“ index entries. The navigation changed to a more app-style like one that users already know from mobile devices when viewing Mahara in responsive mode. The User menu navigation with access to the profile page, Settings, Inbox, and Logout. The Administration menu navigation contains all links to the administration areas. You only see this menu item if you are a staff member or administrator. The Main menu navigation allows everyone to get to all parts of their Content, Portfolio, and Groups. 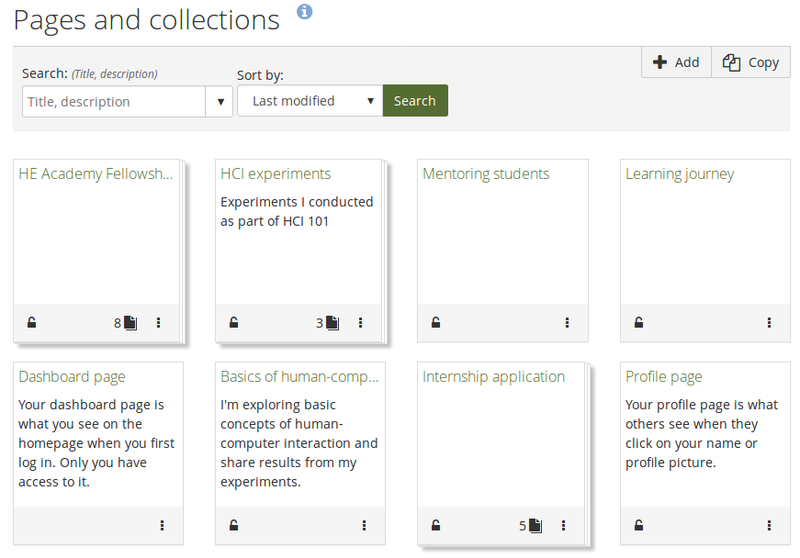 Pages and collections are displayed together on a screen as portfolios. There is no more switching between the „Pages“ screen and the „Collections“ screen to find out which pages exist and which ones are in a collection. Mahara became an LTI provider allowing other systems that are LTI consumers to connect to Mahara for single sign-on purposes. This is useful when wanting to log into Mahara via a learning management system (LMS). This will replace the bespoke MNet connection between Moodle and Mahara and allows other LMS to achieve integration with Mahara. Currently, MNet is still necessary for those who use the Mahara assignment submission plugin in Moodle and the portfolio export functionality. Making these functionalities available via LTI is the next step after the release of Mahara 17.04. With the „Friend activity“ option in the „Watched pages“ block, you can see quickly when friends of yours created or updated their portfolios to which they gave you access. The new print stylesheet allows you to print a portfolio page without showing the URLs. Retracted blocks and collapsed artefact information is automatically expanded for easy viewing. The size of a folder is displayed in the Files area for a quick overview when reviewing the storage quota without having to look at each individual file in the folder. Delete a page when you are directly on it so you don’t need to go back to the Pages and collections overview page. This avoids the accidental deletion of the wrong page. You can restrict access to a portfolio for other people to a certain time frame. This time frame is now mentioned in notifications that are sent to other people. Your personal portfolios are not displayed in the „Latest changes I can view“ block anymore. You only see other people’s portfolios to which you have access. This should help reduce the concern that other people can see your portfolios only because you saw them in the block. You control fully with whom you can share your portfolio. 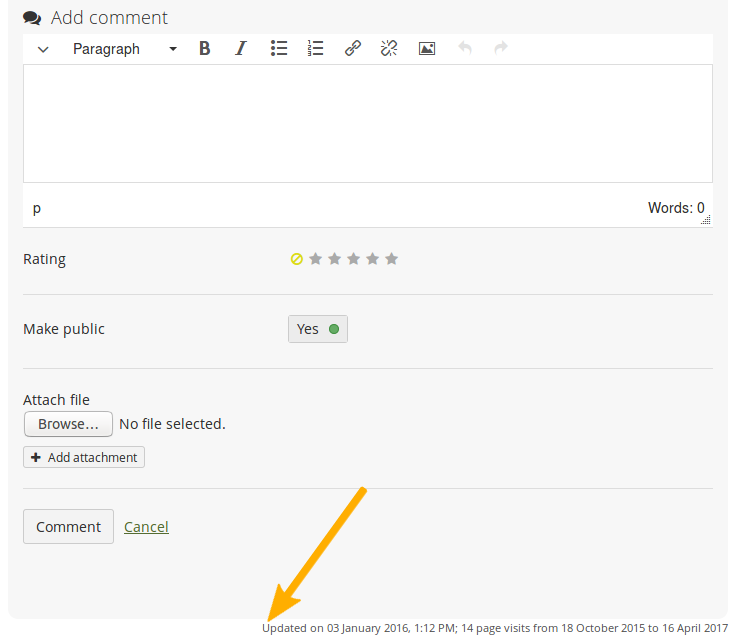 Anyone with access to a page can see when it was last updated at the bottom of the page below the comments section. When you are on a mobile device and select to upload a file, you can take a photo, make a video or an audio recording (Android only for audio) directly. When you have set up single sign-on via SAML authentication, you can now also bring the student ID data across into Mahara so it can populate the student ID field. Add custom profile fields in a local file in the code. You can also display any profile field in Administration → Users → User search. „Find friends“ became „Find people“ under Groups. „Institutions“ in the site administrator navigation under Administration → Institutions became „Settings“ as you choose the settings for a particular institution. „OAuth“ in Administration → Web services became „External apps“. 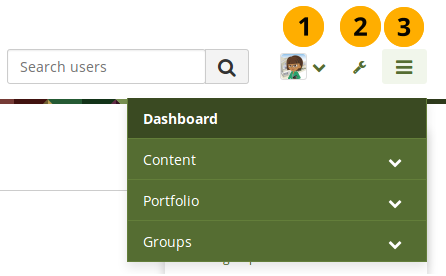 If you build your own theme for Mahara, you can now set it up to inherit from any existing core theme rather than having to base it always on the „Raw“ theme. Any of the built-in themes can be parents allowing you to only make the necessary changes to your theme for a different look. You can use CLI (Command-line interface) to update language packs more easily during an update or an upgrade. Existing languages are automatically backed up and new ones downloaded.